My gardening adventures, has always been a mixed bag of activities, a bag, that I like quite a lot and do like sharing here as well, and quite proudly. While I vie to make my garden beautiful in terms visual beauty, my mother has been towards functionality. While I get flowering plants and seeds, she's been trying whatever eatables she could plant. A couple of weeks back, I posted about the brinjals/aubergines/eggplants for which she asked me to get the saplings of, we planted the plants and after a couple of months, we were able to harvest a good produce from around half a dozen brinjal plants. The scarcity in rainfall did have a serious impact on the produce, and the plants, were quite unable to produce to their full potential. Since then we have harvested some really hot green chillies as well, again from a couple of plants in some pots. I bought lotus seeds, planted them and have got the plants now. 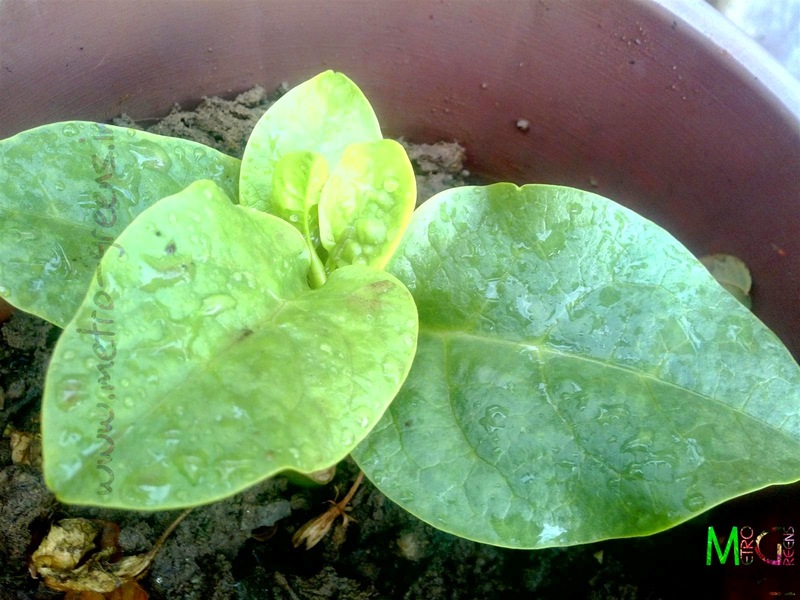 My mother, a couple of months back, had bought some Malabar spinach as vegetable from the market. She decided to have a few stems planted in one of the pots, to see if it really becomes a plant, and to our luck, one of those stems did grow to become a plant. 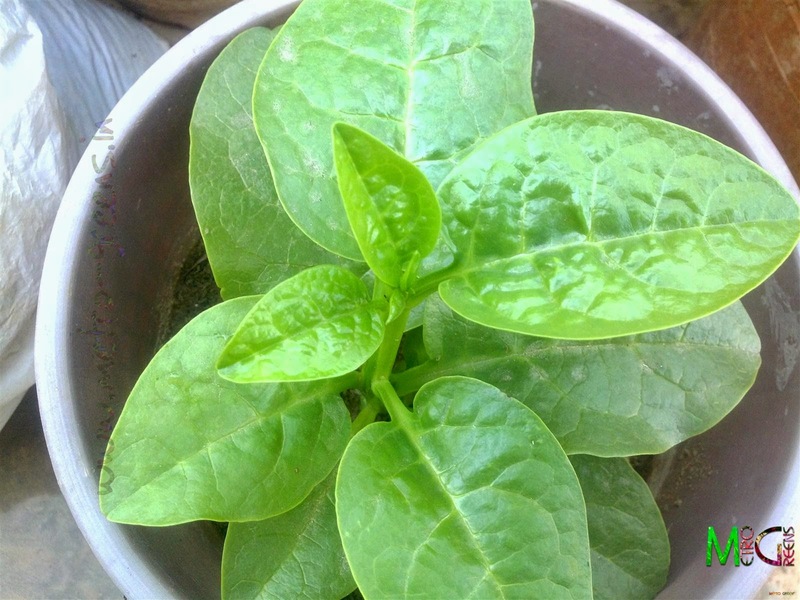 Malabar spinach is a leafy plant, leaves and stems of which are consumed as vegetable. The leaves of the plant are particularly thick and have a typical gloss which makes the leaves quite showy in the green colour. I decided to find some nutritional information from sources like Wikipedia, as I normally do in posts featuring most of the edible plants, we grow. 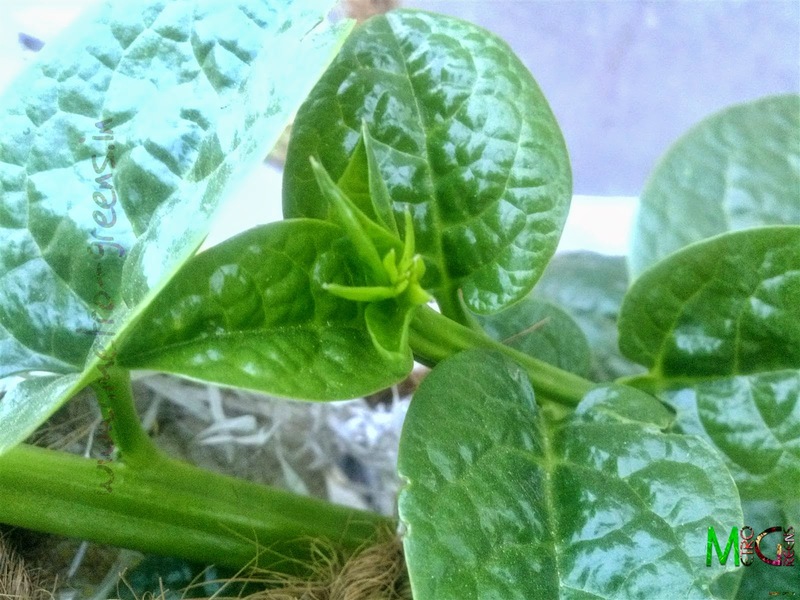 Here's some information about the Malabar spinach. Type of plant: Vine, creeper. Native of: Known as a native of Indian Subcontinent, Southeast Asia and New Guinea. It is known to have been naturalized in a number of other countries, primarily because it is used as a vegetable. Colours: Foliage - Light to dark green. Blooms - white to purplish. Soil Conditions: Isn't very fussy when it comes to soil conditions. But does best in fertile soils with good amount of moisture and organic contents (humus). Varieties: Apart from the green one featured here. The small plant started to grow bigger. 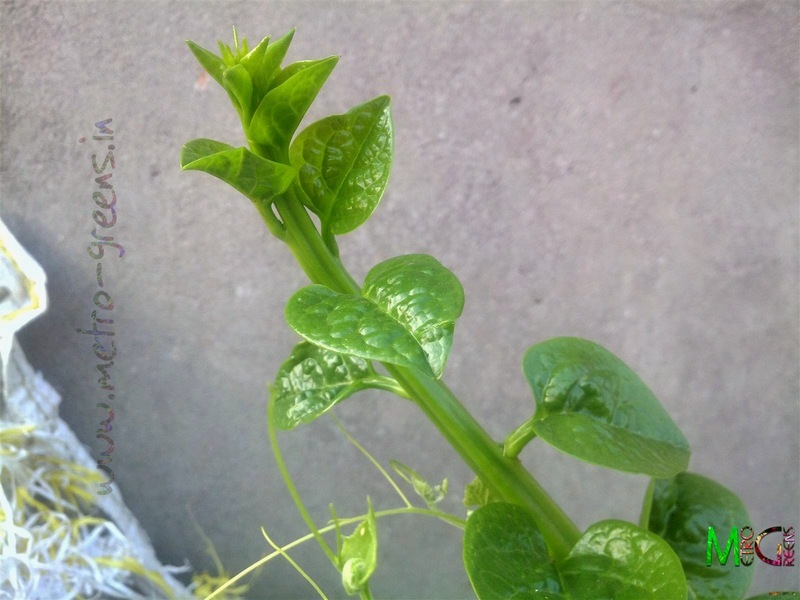 The growing malabar spinach vine. Notice the shine on the leaves. The plant, infact, the vine, which has grown from a small plastic pot to become a more than 12 feet long vine has now reached the blooming stage, with the plant bearing quite a lot of buds. I think, I'll let it bloom and bear fruits, to try planting the seeds from the next year. Since this vine is really easy to plant and needs absolutely no care and growing so big in a small pot like that, I can say that it doesn't need lots of space as well. 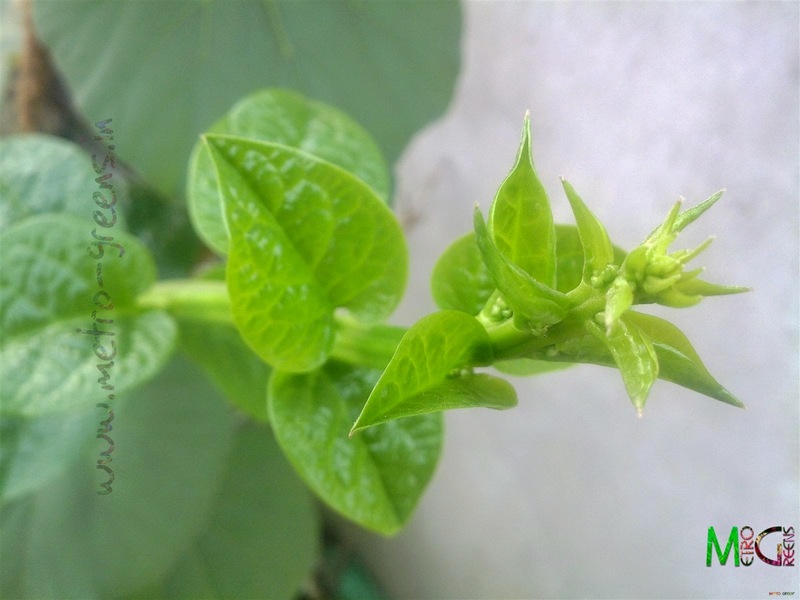 The growing malabar spinach vine. Here are the small buds that I noticed a few days back. Here's small buds that I captured with my cellphone camera today, afternoon. 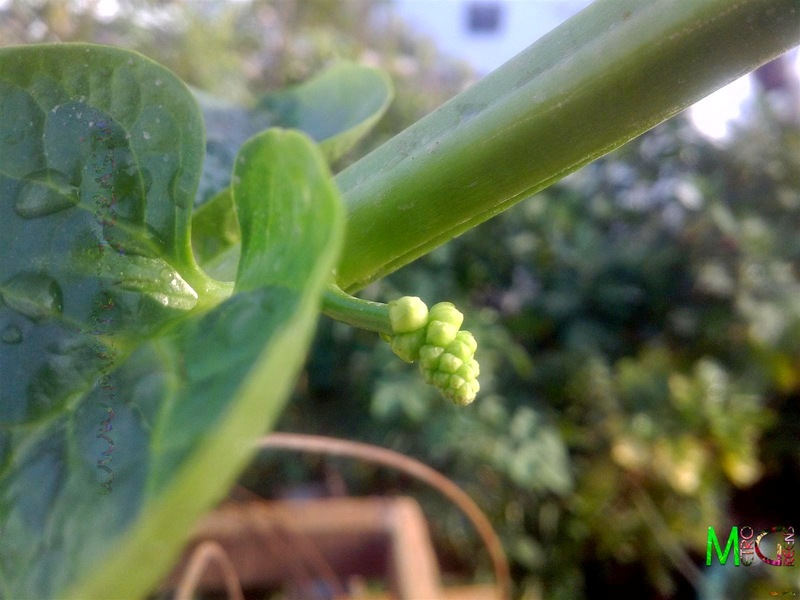 Here's small buds that I captured with my cellphone camera today, in the afternoon. In the upcoming posts, I have a lot of options to share with you. 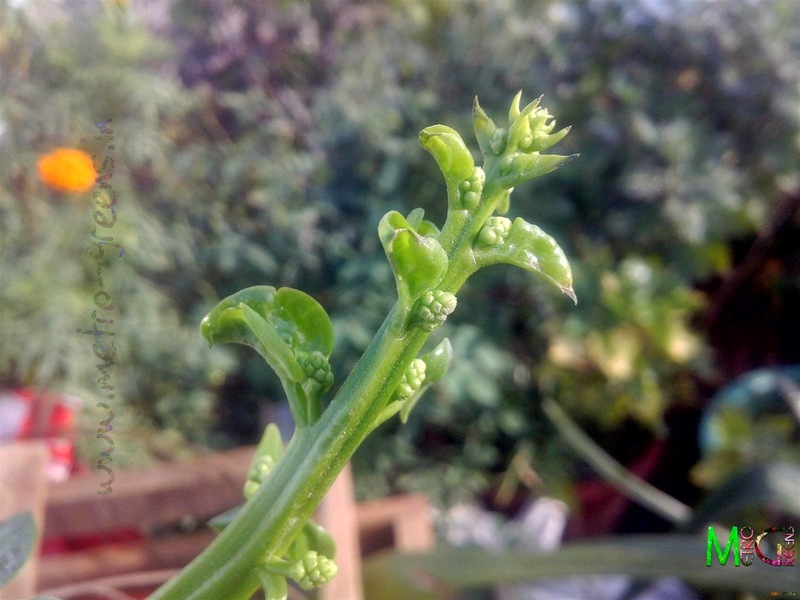 My chrysanthemum plants have started bearing buds, with all the plants now featuring small buds, which, I think will give me blooms in the upcoming week or so. Then I am yet to share the lotus plants which now have small round leaves typical to lotuses. 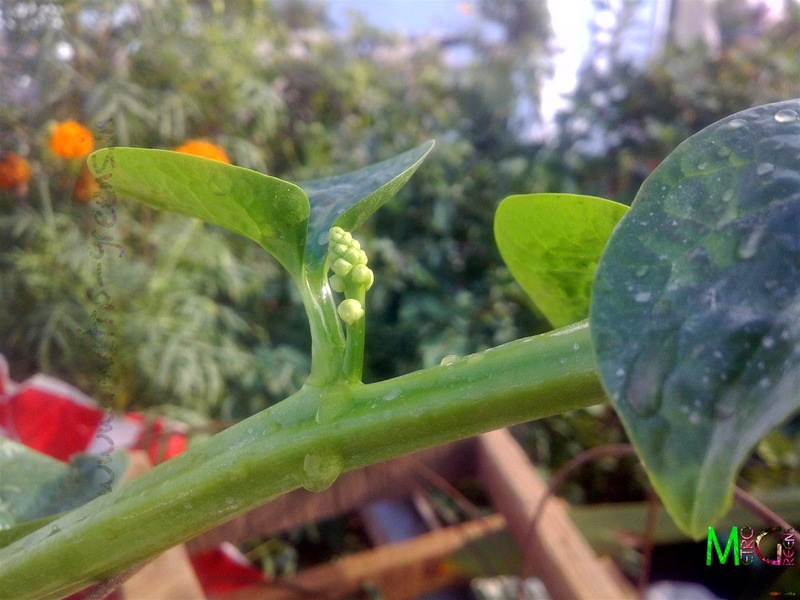 Then I'll be having this Malabar spinach vine blooming by the next week. I'll be back with something from these in the upcoming week. Till then keep trying and HAPPY GARDENING!